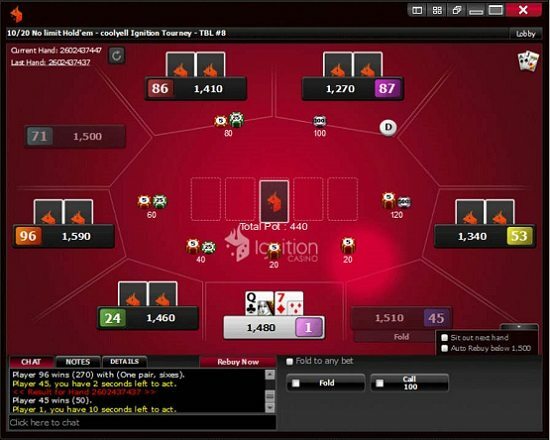 Ignition Poker is a member of the largest poker network open to U.S. players. 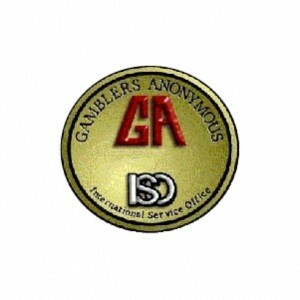 It’s associated with the well-reputed Bodog organization, so it’s a fine place to take a seat at the virtual poker tables. Click here to visit Ignition Poker. Ignition offers a 100% up to $1,000 bonus to all first-time depositing poker players. 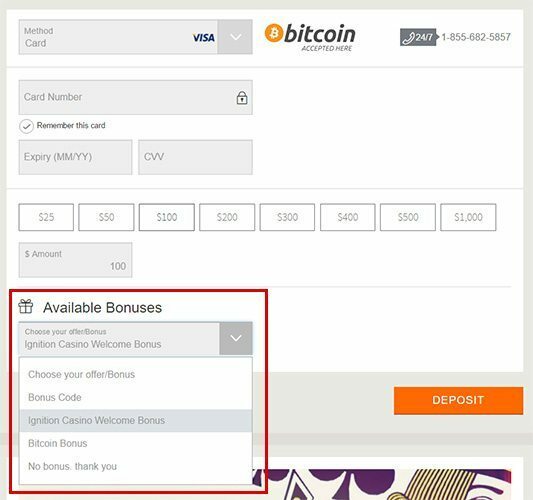 There’s no code that you need to enter to claim it; instead you’ll have to select “Ignition Casino Welcome Bonus” for a drop-down menu within the deposit form. Note that it’s correct to choose the casino bonus because the casino and poker bonuses are both claimed at the same time at Ignition. Click here to visit the Ignition Poker Room. Note that these point totals are cumulative not additive; 10,000 Poker Points is sufficient to clear the entire $1,000 bonus. If the total amount of your bonus doesn’t fit nicely into the tiers described above, then your final bonus portion will be prorated to release at a total of Poker Points proportional to the size of the remaining bonus versus the next listed tier. Your Poker Points do more than just help you gather bonus monies. They can also be traded in for tournament tickets and casino bonuses. The standard rate at which this conversion takes place is 200 points per $1 of rewards. Time-sensitive promos may occasionally run that offer a better rate than this. The points you earn will only be valid until June 1 rolls around. Use ’em or lose ’em. The exception to this rule is points you collect in May. They will last until June 1 of the next calendar year. File your claim by submitting the hand and table number to poker@ignitioncasino.eu or over the telephone at 1-855-370-0600 within 48 hours after the hand was dealt. Contact poker@ignitioncasino.eu or 1-855-370-0600 with your hand number and table number to get this totally free bonus payment. You must do so within 48 hours of hitting your royal flush. At the same time that you take advantage of the 100% up to $1,000 poker bonus, you’ll also pocket a casino bonus of the same size. The rollover is 25x on both the deposit value and the bonus amount. Peruse our Ignition Casino Review for further details on the casino welcome bonus. You’ll find Texas Hold’em, Omaha and Omaha Hi/Lo action at Ignition. Cash games, SNGs and MTTs await your participation at micro-stakes, mid-stakes or high-stakes, whichever is right for you. Immediately upon taking a seat, you’ll see that this isn’t the typical online poker site. Read on to find out why. Under the philosophy of Ignition’s much-discussed recreational player model, no players’ usernames are visible at any time. They are instead listed solely as “Player 1,” “Player 2,” et cetera. This means there’s no bum-hunting and no long-term stats tracking. While professional players might grumble and moan a bit about not being able to efficiently skin the fish, this way of doing things leads to unbelievably soft games. The hand history viewer at Ignition is a bit clunky, but it gets the job done. Of particular note is the fact that after 24 hours, all your hand histories can be seen with ALL HOLE CARDS REVEALED. The poker room can do this because its recreational model means that there’s no way to unfairly take advantage of this information since you won’t be able to sit the same players again on purpose. Ignition differentiates itself from the pack by hosting Zone Poker, the only fast-fold poker product available in the United States. When you opt to play Zone, you aren’t joining a specific table but rather a player pool. Whenever you fold or at the end of every hand, you’ll be moved to a new table with new players for the next hand. Because this transportation occurs immediately whenever you fold, you’ll be able to see new hands much quicker than at a normal table. 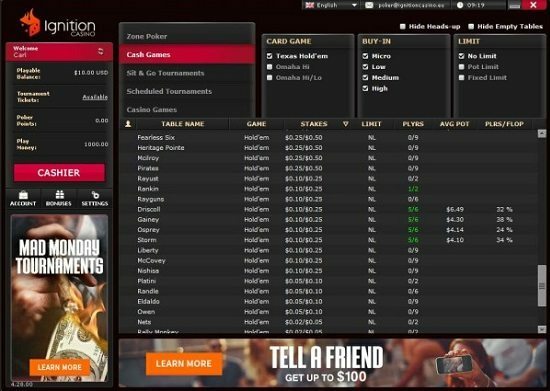 You can use your phone or tablet for poker on the go because Ignition has a mobile client. Actually, it’s accessible through the web, so it’s compatible with any computing device that can run a modern web browser. Unfortunately, only standard cash games and Zone Poker cash games are present. You can’t play sit and gos or multi-table tournaments with the mobile poker solution. The transaction processing at Ignition is a mixed bag. There are deposit fees for using a credit card amounting to between 5.9% and 9.9% of the size of your deposit depending on the type of card you use. If you elect to deposit via Rapid Transfer, then there’s a $12 flat fee. What’s more, you’ll only get one free withdrawal every four months via either check, Rapid Transfer or debit card. Additional payouts within this timeframe will incur a $75 fee! Using the e-currency Bitcoin allows you to bypass all of these issues. Deposits and withdrawals are free of charge aside from the small mining fee (much less than 1%) that you might pay. In addition, BTC permits higher maximum deposits and withdrawals than any other method supported at Ignition Poker. Finally, Bitcoin cashouts are processed within 24 hours, which beats the 5 – 10 day waiting period for the other methods available. Ignition Poker welcomes players from the United States and only from the Untied States. However, there are a few states from which signups aren’t permitted. They are: Delaware, Maryland, Nevada, New Jersey and New York. As long as you don’t reside in one of these five states, you’re good to go at Ignition. Receive up to $1,000 in poker bonus! Get the Ignition Poker download here. You can read another review of Ignition Poker here. You can find the latest Ignition Poker bonus codes here.